The new COVER GUARD sterile tube covering offers an efficient and economic solution for the protection of video cameras and their connection cables in use with endoscopic instruments (arthroscopes, etc.). 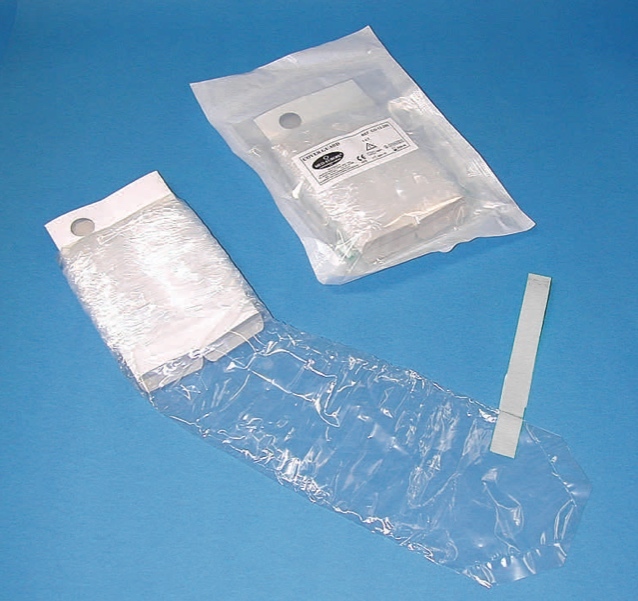 The COVER GUARD sterile tube covering is mounted on a rigid cardboard support at one end. Pressing lightly on the sides of the support facilitates the opening of the tube covering and allows the introduction of the video camera and cables. The other end of the tube covering includes a strip of adhesive tape to wrap around and hold the cables at the exit point. By way of its unique accordion-fold extension feed system, the COVER GUARD was designed to allow the operator to slide the precise amount of tube covering necessary over the cables and to see exactly how much tube covering remains on the support during cover preparation. The cardboard support has two holes which facilitate the extension operation and may be used to anchor the support to the video camera controls. The COVER GUARD is also practical for many other uses, wherever a sterile covering is required for exceptionally long accessories, or to help reduce bacterial contamination of instruments or products which are not possible to sterilize.